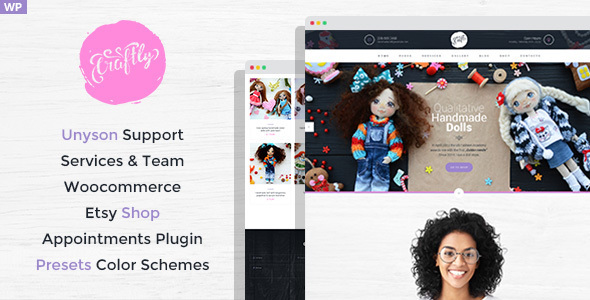 Craft is our new WordPress Theme, created for hand-made crafts, dolls, toys and gifts shop website. Itâ€™s bright and colorful and will definitely grab your visitorsâ€™ attention to it! Having a website for craft goods is a great idea because a decent Internet presence is a wonderful chance to promote your product all over the world. With its help your company will naturally gain a solid base of visitors that will be growing with time. This hobby and crafts WordPress theme is highly customizable thanks to the Unyson Page Builder and awesome Customizer Tools! This theme is perfect for craftsmen because it has Etsy integration and a WooCommerce Support, which means you can start selling right away after installation! The theme supports the most popular plugins like MailChimp, Contact Form 7, Etsy Shop, Booked and others. Comes with predefined color schemes, features fonts from Google Font Library and Font Awesome icons. So just give it a try and youâ€™ll see your business grow! And in case anything goes wrong, our support team is always near to help clear things out!